In advanced endoscopy, what classifies as a “difficult case”? The answer is, of course, different for each advanced or interventional endoscopist. Some might define the level of “difficulty” based on the endoscopic technical aspects, some consider the procedure complications, while some reflect on the emotional engagement during the treatment of any particular case. ‘What is the most difficult case of advanced endoscopy you have ever encountered? What have you learned from it?’ Scope has invited 4 prominent advanced endoscopists in Hong Kong to share their stories with us. An 80-year-old lady was admitted to the hospital for high fever, abdominal pain and jaundice. A CT scan of her abdomen confirmed the diagnosis of acute cholangitis due to biliary stone. After initial treatment with antibiotics, she was sent to the endoscopy unit for ERCP. The initial ERCP was smooth with a plastic stent placement for biliary drainage. The lady was discharged. 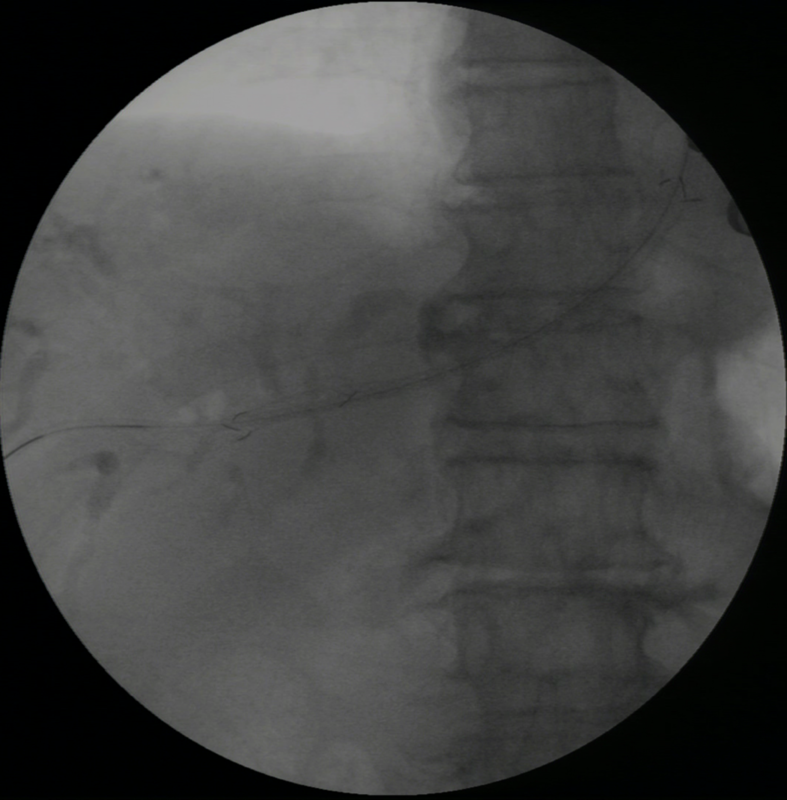 4 weeks later, the lady was admitted again for ERCP stone removal. At the beginning, the procedure was very smooth. The plastic stent was removed and the cannulation of the bile duct was successful in a very short time. The cholangiogram showed multiple big stones up to 2cm in diameter inside the bile duct. A generous sphincterotomy was made. Next, I decided to remove the stones by mechanical lithotripsy. Some small stones fragments at the distal CBD were successfully engaged into the BML. The nurse assistant started to crush the stones by rotating the wheel of the BML. However, she found the stones were so hard that the wheel went slippery. With considerable effort, we managed to crush and remove the small stones. Following the initial success, I tried to remove the remaining stones. One large stone was successfully engaged after a few attempts. We turned the knot again to crush the stone, with great force, a pop sound was heard from the BML. The central wire of the BML fracture! My heartbeat raced and started sweating profusely. I paged the director of endoscopy for assistance. ‘Prof Lau, I am sorry things went wrong. May I ask for your help? I have a lady with trap BML and cannot be managed by Soehendra lithotripter handle. The patient is stable at the moment’ I spoke urgently over the phone. ‘I’m coming, please prepare cholangioscopy and laser device.’ Professor James Lau replied. ‘We are lucky Professor Lau is available.’ I told the nurse.’ Professor Lau came over in 5 minutes. He used the laser to cut the BML wire. It took half an hour to cut one wire. After cutting 3 wires, the BML was loosened and removed. A plastic stent was inserted at the end of the procedure. 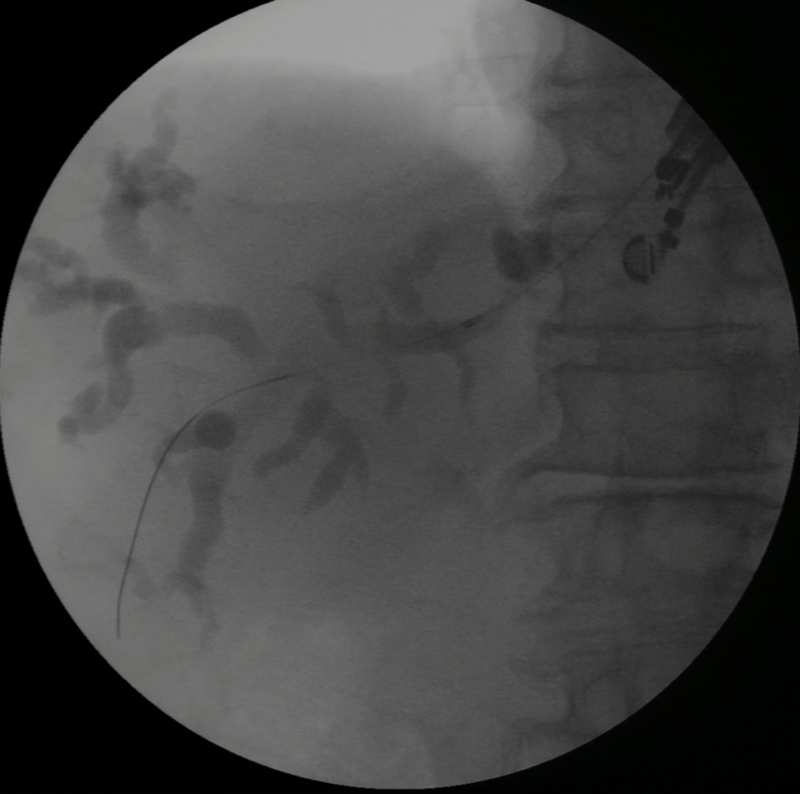 A few weeks later, the patient underwent her last ERCP with stone removal under laser lithotripsy. I have learnt a valuable lesson in this difficult ERCP. When things go wrong, it usually doesn’t happen all of a sudden. Rather, there will be some signals to suggest stopping the procedure or change the plan. The small stones were not removed smoothly by BML, and therefore I should change strategy to remove the large stones to avoid complications. In my memory, the most difficult case was one where I could not alter the patient’s disease course in spite of my best effort coupled with the most advanced technology in endoscopy. It is one of those moments when I was forced to accept the fragility of life and limitations of advanced technology in treating human beings and diseases. I often think of my patient, CL, who passed away a few years ago from complications of IgG4 disease, when I am asked to describe some of the most difficult and challenging cases during my practice in advanced endoscopy. CL was a gentleman in his 70s when he first consulted me for the management of his recurrent IgG4 disease of the hepatobiliary system. IgG4 disease is an autoimmune condition that often affects the lymph nodes, biliary tree, pancreas and liver. However, when CL first presented with symptoms of the IgG4 disease (bile duct narrowing causing obstruction) more than 15 years ago, doctors’ understanding of this rare autoimmune condition was limited so he was thought to have bile duct cancer and was subsequently managed with surgical resection and reconstruction of the biliary system and small intestine. The resected tissue specimen finally revealed the actual disease entity --IgG4 disease, instead of cancer. His IgG4 disease was in remission until several years ago when he presented with recurrent episodes of obscure GI bleeding and cholangitis, leading to a GI consultation. Because of his surgically altered anatomy, we performed balloon enteroscopy assisted ERCP, a technically demanding endoscopic procedure, which finally helped us to solve the mystery. What CL actually had was recurrent inflammation of his biliary-intestinal anastomosis caused by active IgG4 disease, resulting in bleeding and biliary obstruction. Despite solving one important mystery by the use of advanced technology, his subsequent clinical management was still full of challenges. For example, the need for multiple medications including immunosuppressive medications and a delicate balance between adequate control of his autoimmune disease, but without putting him at risks for recurrent infectious complications and bleeding in an elderly patient with multiple comorbidities. It is common that many patients may be aggravated with confusion and fear by the diagnosis of a rare chronic condition without a definitive cure, leading to frequent clinic visits or hospitalization. Some might even sink into denial. In contrast, CL’s calmness and optimism about his condition surprised me during my care for him. During his multiple hospitalizations, he would tell the treatment team that he has looked up his condition on the internet and appreciated what the team had done for him and his condition. Unfortunately, his disease condition gradually worsened despite adequate treatment, leading to increasingly frequent admissions for the management of disease related complications. I was saddened to see how his condition deteriorated over time despite offering him our best medical treatment and the most advanced endoscopy. CL eventually passed away due to infectious complications after fighting this rare illness for many years. CL was my first IgG4 disease patient who passed away (most of my IgG4 patients are younger and less sick). This case also qualified as one of my most difficult cases in advanced endoscopy. Perhaps, many of my colleagues would remember CL because of all the difficult endoscopic procedures our team had done together for him. I remembered CL because of his cheerfulness and optimism in fighting his rare disease condition and complications together. The term “difficult case” may have a different meaning for different advanced endoscopists. But for me, as I have illustrated with CL’s case, the most difficult aspect of advanced endoscopy was to lose a long term patient and a long term friend who had worked together with me all these years in his disease treatment. I dedicate this article to CL. Fig 1. Fluoroscopy image of double balloon enteroscopy assisted ERCP for bile duct cannulation in patient CL with Roux-en-Y reconstruction. Fig 2. Stenting of the oozing, inflamed hepatojejunostomy by double balloon enteroscopy assisted ERCP. There have been many advances in endoscopy recently. Amongst them, EUS-guided biliary drainage has attracted tremendous interest worldwide, as a means to replace the need for percutaneous biliary drainage. This is what we have done to help an 81-year-old gentleman. This gentleman has a known history of gastric cancer with subtotal gastrectomy performed 1 year ago. However, his tumour was quite advanced and he soon suffered from a recurrence of his gastric cancer with obstruction of the biliary tract due to lymph node recurrence at the hilum of the liver. Since the patient had a prior Roux-en Y reconstruction, endoscopic retrograde cholangiopancreatography (ERCP) is difficult as the papilla is difficult to reach. 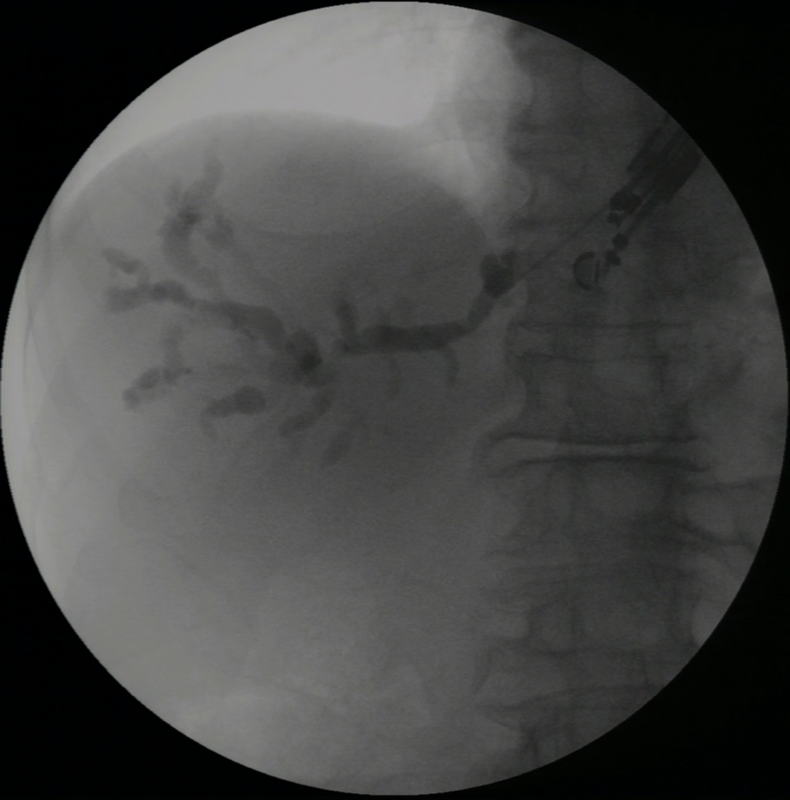 Traditionally such patients require a percutaneous biliary drainage. However, the external drainage tube is invasive and internationalisation requires a second procedure. To treat such difficult cases, EUS-guided biliary drainage (hepatico-gastrostomy) has been developed. We performed this procedure on this patient as an alternative means of internal drainage without an external tube. The procedure allowed placement of a stent from the left intrahepatic ducts to the stomach. The left lobe of the liver was first visualised with a linear array echoendoscope from the stomach. The intrahepatic bile ducts were then punctured and contrast was injected to perform a cholangiogram. A guidewire was then inserted and the track dilated with cautery. 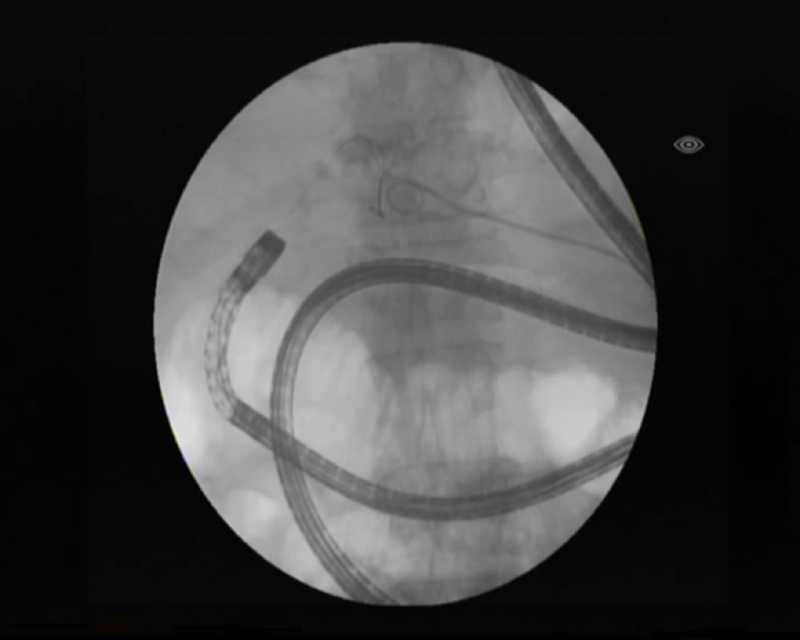 A 100 x 60mm partially covered metal stent was then inserted, bridging the left intrahepatic duct to the stomach. The patient enjoyed an eventful recovery and was sent to oncology for assessment for palliative chemotherapy. This case illustrates only one of the approaches for EUS-guided biliary drainage. Several other options are also available depending on the aetiology of the biliary obstruction and also the anatomy of the patient. These include EUS-rendezvous ERCP, EUS-guided choledochoduodenostomy and antegrade stenting. Several randomised studies have shown that EUS-guided biliary drainage was associated with the reduction of adverse events and reinterventions as compared to percutaneous biliary drainage. Hence, EUS-guided biliary drainage has been gaining popularity as a means of obtaining biliary drainage in patients with failed ERCP. Studies are also currently ongoing to assess if EUS-biliary drainage could provide longer stent patency as compared to ERCP. Fig 1. 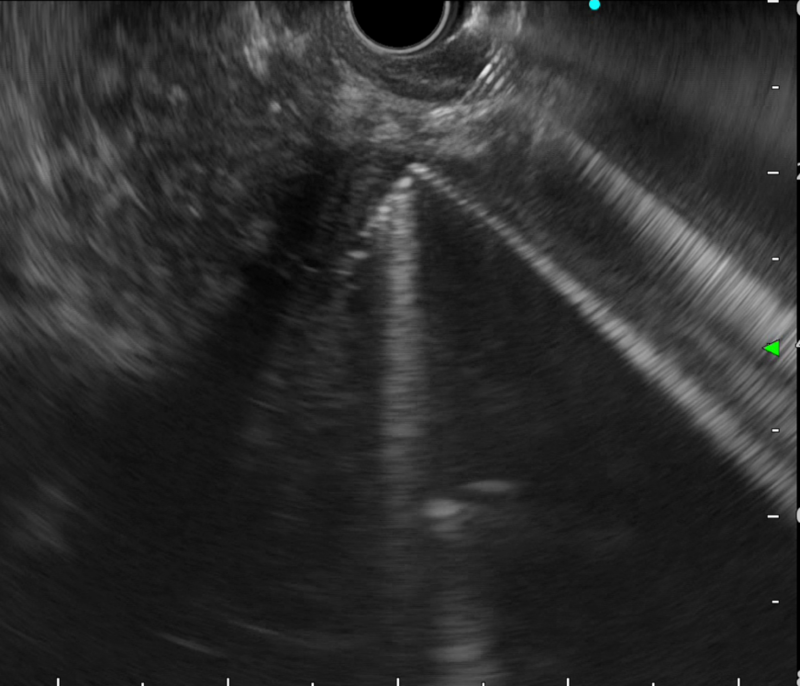 EUS-guided puncture of the left intrahepatic duct. Fig 2. Injection of contrast to show the cholangiogram of the patient. Fig 3. Insertion of guidewire and a cautery dilator for track dilation. Figure 4. Complete deployment of the partially covered stent and conclusion of the EUS-guided hepaticogastrostomy. One of the great privileges as a therapeutic endoscopist is to witness the evolution and development of novel endoscopic techniques and devices to improve the lives of our patients. Recently, we had a patient admitted to hospital for cholangitis from obstructing biliary stones. Standard management was to perform endoscopic retrograde cholangiopancreatography (ERCP) for stone clearance. Biliary cannulation was challenging, however, despite multiple attempts by experienced endoscopists, in part due to a large periampullary diverticulum. The traditional alternative would have been percutaneous drainage, but patients and their families would be burdened by the care of an external drain. 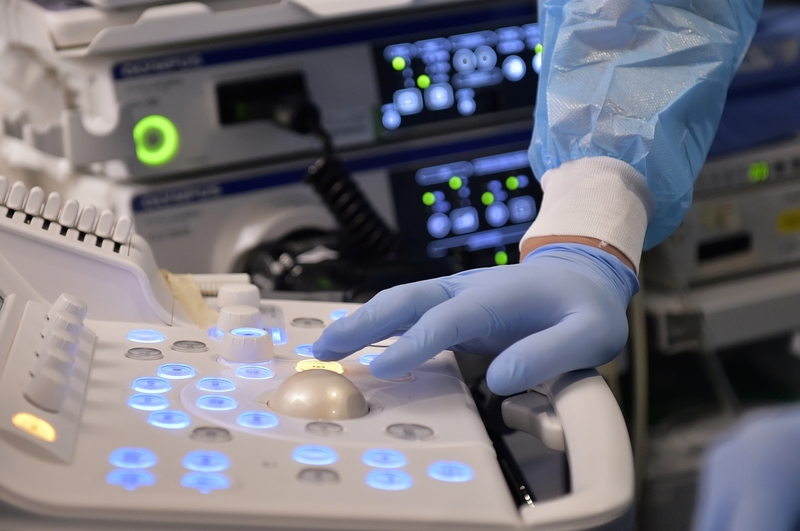 The advent of interventional endoscopic ultrasound (EUS) has dramatically widened the therapeutic potential of endoscopy. After discussion with the patient, our team performed an EUS guided biliary rendezvous procedure. The bile duct was punctured with a 19G fine needle aspiration needle from the duodenum. With gentle manipulation, a 0.025” guidewire was advanced into the bile duct, across the papilla and into the duodenal lumen under fluoroscopic guidance. Cannulation alongside the in-situ guidewire resulted in successful biliary cannulation. 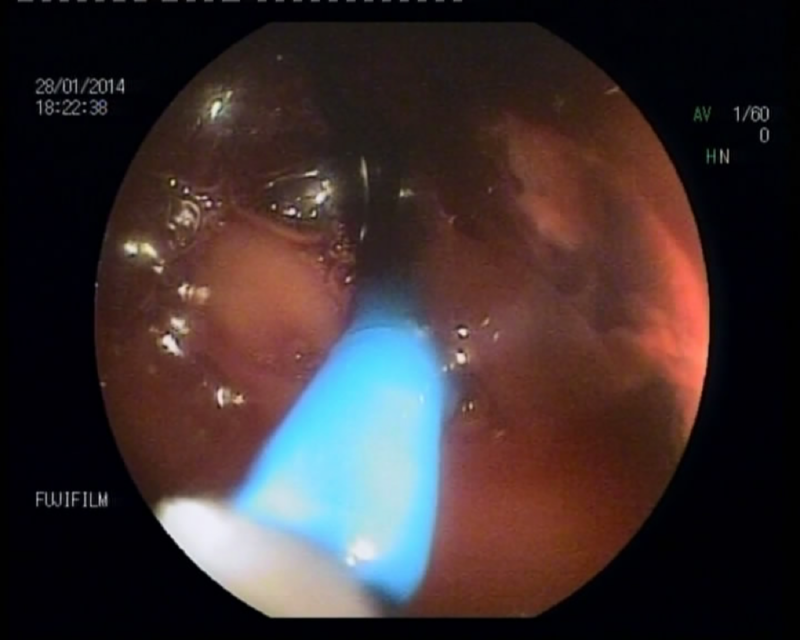 This is one example of the incorporation of novel endoscopic techniques for the benefit of patients at the Prince of Wales Hospital. Not only are we constantly learning from each other, but we have multiple opportunities to learn from master endoscopists throughout the world who are invited to attend the International Digestive Disease Forum in June and the International Workshop on Therapeutic Endoscopy in December of each year. These Institute of Digestive Disease-led or affiliated initiatives are often platforms for international experts and companies to showcase clinical application of the latest devices and techniques in the fields of luminal gastroenterology and the pancreatobiliary system. Examples include endoscopic submucosal dissection, peroral endoscopic myotomy or tumor resection, ERCP digital cholangioscopy, and EUS guided biliary and gallbladder drainages. As the limits of endoscopy expands evermore, it is an exciting time to be a therapeutic endoscopist in Hong Kong, a crossroad of expertise between the East and the West!